Cozy season means snuggling in and savoring the last bits of warm sunlight each day. Soup is the king of comfort food we turn to for contentment and what the Danish call hygge. 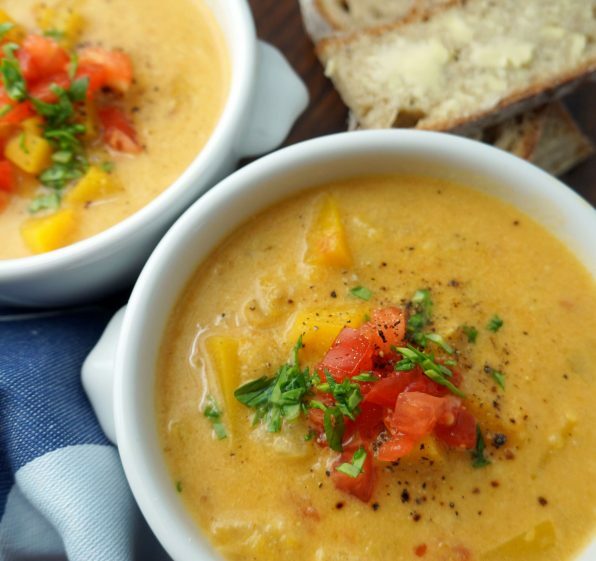 I hope this Butternut Squash Leek Apple Curry Soup gets you into the soup making mood. It’s more than the sum of its parts, somewhat salty, sweet and a touch piquant. This chunky soup combines chopped leeks and rough-cut butternut squash, apple and tomato cubes in a subtly creamy broth. As bits of the squash and tomato break down, they make the soup stock cloudy. Pureeing some of the finished soup plus adding coconut milk at the end brings the soup together. Hard squash like butternut can be challenging to cut. But once you get a flat side, half the work is done. Here’s how to do it. Peel the squash using a vegetable peeler. Then cut off its head. (Just cut the squash in two at its narrowest point, the “head”. ) Then stand each piece on the flat end and cut in that in half. You’ll have four smaller pieces of squash with flat sides that will rest steadily on your cutting board. Now you can safely chop away. Or buy a bag of pre-cut squash. Making soup tests a cook’s skill with seasonings. You need to taste at every stage and adjust the seasonings as you go. Add salt only a little at a time because the flavors will concentrate as the soup simmers. 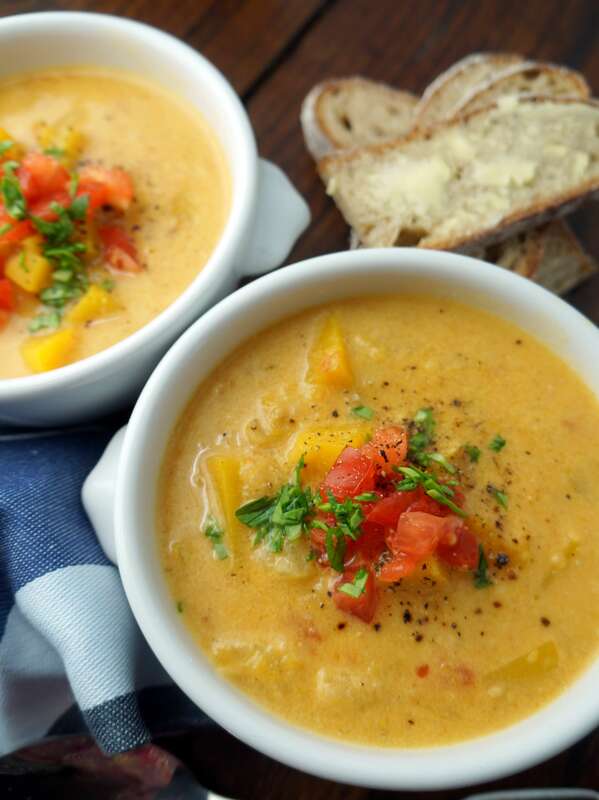 Under ripe vegetables bring more acidity to the soup. Ripe tomatoes may be sweet and juicy or mealy and dry. Take that into account as you decide to simmer the soup longer. You can even chill the soup overnight then adjust the seasonings when you reheat it. That’s what I often do. We teach students in culinary school to consider the style of their restaurant when developing each dish. A rustic café merits a chunky soup like the one pictured here. Foods with a rustic appearance seem approachable even if the flavors are more adventuresome. But if you want something a little swanky, puree the soup. It will look like any other seasonal butternut squash soup with an unexpected taste. For this recipe, I used Penzy’s Maharajah Style Curry Powder, but any quality brand will work. Freshness really matters when it comes to dry spices. Because Penzy’s is popular and the spices turn over quickly, I depend on them for freshness. Trim the outside leaves and any tough green tops from the leek. Cut off the stem. Split the leek in half lengthwise. Rinse it under cold running water then chop the leek into ¼-inch pieces to make approximately 1 cup. Peel squash with a vegetable peeler. Be careful because it gets slippery. Cut the round end in half. Scoop out the seeds and save them to toast if you like. Dice the squash into ½-inch pieces to make approximately 5 cups. Peel then quarter the apples. Cut out the core and peel each piece. Chop the apples into ½-inch pieces. Sauté the leeks, chili, garlic and ginger in the oil over medium high heat until softened, for about 5 – 6 minutes. Add the squash, apples, diced tomatoes, curry powder, cumin and stock. Stir to combine. Cover and bring to a boil over high heat. Reduce the heat to low and simmer, covered until the squash and apples are tender and the flavors blend, for 20 – 30 minutes. To serve, heat the soup to boiling. Remove 1 cup of the soup. Place it in a blender and process until smooth. (Or insert an immersion blender into the soup and purée it slightly.) Remove the soup from the heat and stir in the coconut milk. Heat it gently if needed. Adjust the seasonings. Garnish with generous amounts of the chopped parsley. Preheat the oven to 375°F. Spread the diced squash and apples out onto a greased paper-lined sheet pan. Roast until the squash and apples are tender, for about 15 minutes. Add the cooked mixture in Step 5 with the listed ingredients. Simmer 10 – 15 minutes to blend the flavors. Puree the soup until silky smooth before serving.